Time is running out – the human race is hurtling towards destruction. This is the setting in which Andy Andrews’ latest book, The Final Summit, opens. David Ponder, a successful businessman and millionaire, reflects upon his trip through time; when he met with other Travelers, and gained seven Keys to success. Now, all of humanity hangs in the balance, as David leads all of the Travelers in the final Summit. This book is not written like a normal novel. 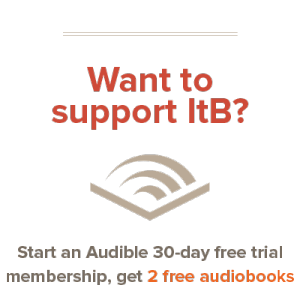 A large percentage of the book takes place within a meeting hall, where most of humanity’s greatest minds are gathered. These are the Travelers, and they have been appointed to answer the following question, “What does humanity need to do, individually and collectively, to restore itself to the pathway toward successful civilization? Throughout the book, David discusses this question with many great people of the world, including Winston Churchill, Joan of Arc, Abraham Lincoln, King David, and George Washington Carver. They, along with the other Travelers, are given five chances to guess the correct answer to the problem. All of their guesses are wrong, and the hourglass which measures their time continues to decline. As the last grains are falling through the hole, Joshua Chamberlain, Ponder’s personal hero, provides an answer which stops the flow of sand. They present it to the angel Gabriel, despite having used their allotted five guesses. Is their guess the correct one to save humanity? Now. Let’s move on past the plot, into what I liked about the book. Andy Andrews is a good fiction writer, at least based off of this book. His dialogue is masterful, and his characters, though grounded in history, are carefully crafted. As a writer, I really appreciated reading the words in this book – it certainly is an exciting read. As a matter of fact, I read it in a single afternoon, unable to put it down. However, there were many, many, angles about this book which disturbed me. Many times, the main characters show a disturbing lack of trust in God and His plan. It is clear, I believe, through reading this book, that Andy Andrews does not have a true understanding of God. As Andrew’s protagonist, Ponder, says, “The Flood? You mean Noah and the Ark? That actually happened? I always assumed it was…you know, a story, a parable.” Throughout the book, Andrews consistently refers to Biblical events and God Himself with this sort of disbelief. It is unclear to me, upon finishing the book, if Andrews is a Christian or if he has just written a book about God. Which brings me to my biggest problem with the book. Do you know what Andrew’s biggest problem is? Not once, not once, does Andrews mention the true solution to humanity’s problems. The answer was not among the Traveler’s five wrong choices, and nor was it the one ‘correct choice’ (That being said, ‘doing something’ is a good thing to do; we should not be complacent. But that is for another post.) The correct answer is not something that we do. It is something that was done for us. The Final Summit is not a fictional meeting that took place between humanity’s supposedly enlightened humans. No, the final summit occurred, 2,000 years ago, when a man on a cross gave up His life for our sins. There are no travelers from this Earth, as Andrews claims, but there was one Traveler, who came from heaven to earth, taking the very form of a servant, to give his life as a ransom for many. It is with all of my heart that I write the following: do you want the answer for humanity’s problems? It is not among humans – we will only devolve, as Gabriel said in the book. I will show you the Book in which you will find humanity’s problems. It is the Bible: divinely-inspired and handed down to us from heaven itself. The answer is not written in a book written by a self-help guy, or anyone else. And as enjoyable as fiction like The Final Summit can be, I highly, highly encourage you to find the true answer to the question in the Bible, a book penned by God Himself. 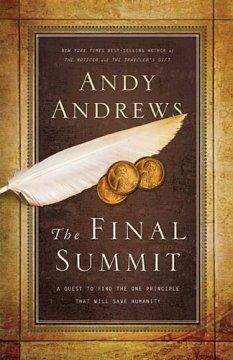 Article first published as The Final Summit By Andy Andrews on Blogcritics. This book provided to us for free via Booksneeze. Fantastic review! Thanks for sharing, Andrew. Many writers don’t do thing like answer those questions like how to save humanity because humans are just as people corrupted and there reall isn’t that perfect solution to solve this. Besides many people have differnt beliefs on all of that and sometimes it is better to remain neutral. @Storydreamer: You are right; a lot of times people just want to avoid these questions and go with the flow. I admire Andy Andrews for his courage to write on these things, but I wish his thoughts had been on the money. Thanks for commenting! Amen. I found the same problems with the book that you did. Thanks for the review.